Deliciously aromatic and packed with a kick of flavour. 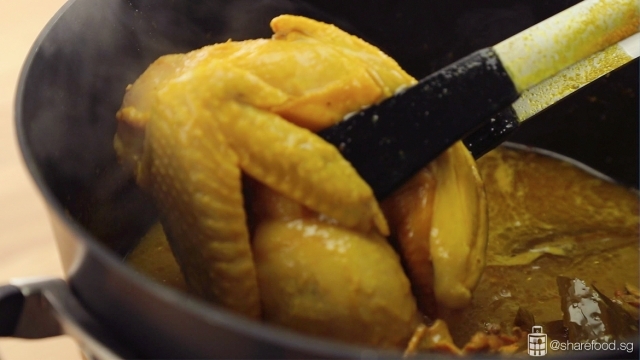 This Indonesian dish has won the hearts of many here in Singapore and it's easy to see why. It is flavourful, comforting and filling as well! 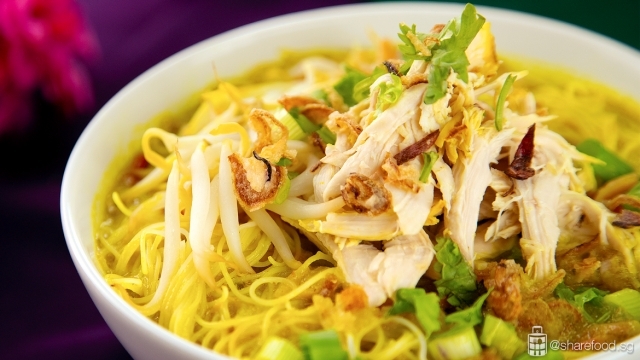 This Indo-Style Bee Hoon Ayam Soto recipe is shared by veteran home cook Anne Leong who is dedicated to creating healthy and tasty dishes. 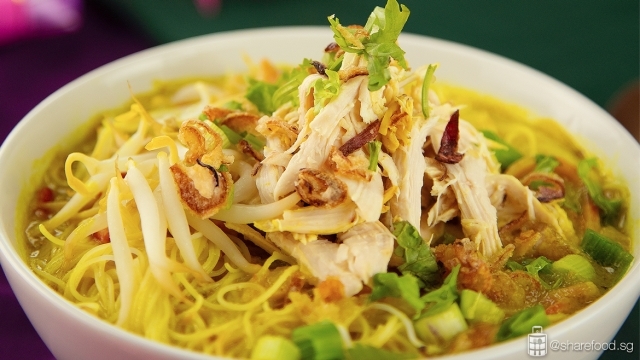 Aromatic chicken soup with fine vermicelli and topped off with bean sprouts, coriander and a generous amount of shredded chicken. For this recipe, we will be starting with the spices for the soup. Pulse the spice paste ingredients in a food processor and chop till fine pieces. Transfer the paste into the blender attachment, add water and blend till a fine paste. Add in the dry spices and cook till fragrant. Blend till the ingredients come together and form a smooth paste. Pour in water and add in the chicken stock cube. Bring it to a boil, place in chicken bones and whole chicken. Reduce to medium heat and simmer for at least an hour. Remove the cooked chicken from the pot and set aside to cool. Shred the meat and place the bones back into the soup. Simmer for another 1 hr over low heat. Season with salt and sugar. 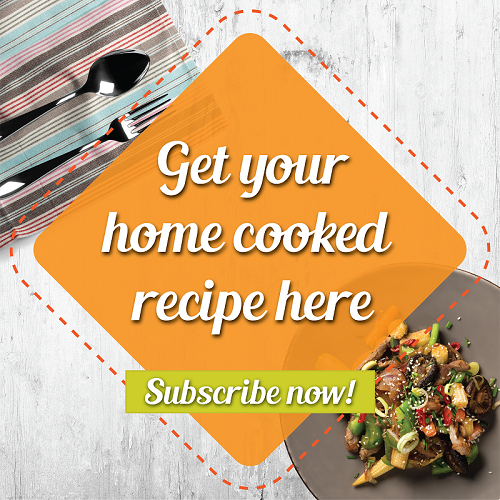 When chicken is cooked, remove from pot and shred meat. Meanwhile in a pot of boiling water, blanch vermicelli and bean sprouts. Spoon soup over vermicelli and top with bean sprouts and shredded chicken. Garnish with fried shallots, spring onions and coriander leaves, then serve. Deliciously aromatic and packed with a kick of flavour. Fragrant and rich, this spice-packed vermicelli chicken broth will warm the hearts of your loved ones. Deliciously aromatic and packed with a kick of flavour. This Indonesian dish has won the hearts of many here in Singapore and easy to see why. It is flavourful, comforting and filling as well! 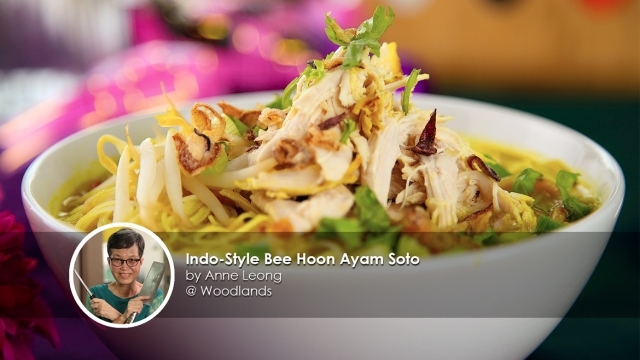 This Indo-Style Bee Hoon Ayam Soto recipe is shared by veteran home cook Anne Leong. Add spice paste ingredient, except for the water, into the food processor and pulse to chop ingredients into fine pieces. 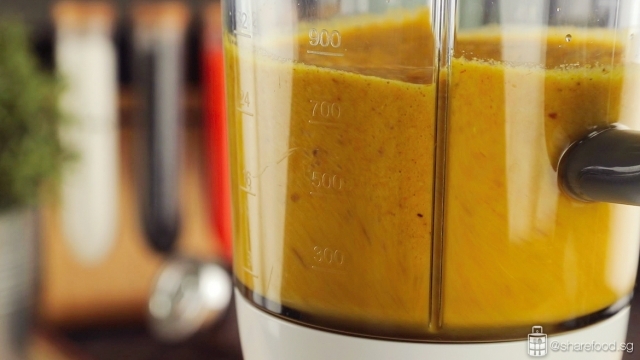 Transfer the chopped ingredients into the blender attachment, pour water in and blend till a fine paste is formed. Add in more water for a smoother blend. Heat up 4 tbsp oil in a pot and add in the blended ingredients and sliced onions. Stir fry till fragrant. Add in the dry spices and cook till fragrant and turns to a darker shade of yellow. Turn to a medium heat and let the soup simmer for at least an hour. Check the pot every 15mins, add more water if required. Remove the cooked chicken from the pot and set aside to cool. Shred the meat and return the bones to the soup. Allow it to simmer for another 1hr over low heat. Season with salt and sugar. Switch off the flame, cover and keep it warm. Blanch the vermicelli and beansprouts, garnish and serve. In a pot of boiling water, blanch vermicelli and bean sprouts. Dish into a serving bowl. Top it with shredded chicken and garnish. Heat up the soup and pour it over the vermicelli. Serve with green chilli.